Essex Police making Chelmsford City a safer place? No! It is not often that I have needed to call upon my local police force, Essex Police. I called 999 at around 19:00 on 10th June to report that a large group of over 20 youths aged 15 to 18 were at my front door making threats. I explained that my son had already been assaulted and that I had prevented a further attack, and that now a large group were making threats at our home. The Essex Police operator said that this was a priority incident and that I should stay on the phone with her as officers were being sent immediately. My daughter managed to lock the front door whilst I was on the phone to Essex Police. The operator then said that so long as we were safe she would go? I explained that the group were still outside shouting and making threats. My children were still very worried, fearing that one or all of us were going to be attacked or worse! After 45 minutes I called Essex Police again on 101 to find out why they had not arrived? It was after all a “priority incident”! The Essex Police operator told me that my 999 call was a priority and they would be there within an hour (with only 15 minutes left?). I asked to make a complaint as I felt that my family were still in danger. I also believe that if Essex Police had responded sooner that they would have caught some or all of the offenders. The operator said that she would ask one of the sergeants to call me about my complaint shortly. Surprise, that call, like Essex Police never came! I am writing this blog, very angry at Essex Police. Nearly 5 hours after my initial 999 call and not even a phone call from them! 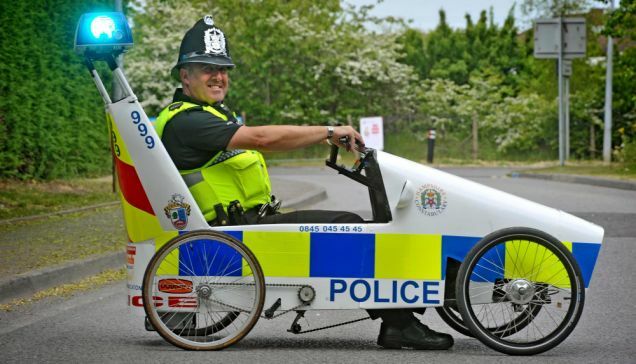 Essex Police High Priority Vehicle? I can only assume that budget and/or staff cuts have reduced them to using their latest crime fighting vehicle to attend “priority incidents” (left). This however is not a joke! I genuinely felt that my home was about to be overrun and that my children were in serious danger. I did finally receive a phone call from Essex Police (not a visit) at 23:41. I explained to the officer that him contacting me almost 5 hours after my “emergency” 999 call was pointless. After this long anything could have happened. I called Essex Police thinking that due to the serious nature of my call that they would arrive quickly to deal with the incident. I was wrong! In our wonderful new city of Chelmsford, with all the additional revenue from; an increase in council tax, street lights off at midnight and the council car parks making millions of pounds we can’t get Essex Police to respond to a “priority incident” in less that 5 hours! When I spoke with the officer at nearly midnight I told him that I didn’t want them to visit and I didn’t want to make a statement. I have no confidence in Essex police to be of any use in this or any other matter now or in the future. If they cannot attend within 5 hours then what hope do they have catching the offenders? Forget 999, forget 101, you’re better off calling 118 118 and asking for the Ghost Busters. 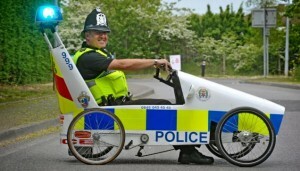 They will probably turn up faster and be of more use than Essex Police! So, why did Essex Police not attend my home after me calling them some 5 hours previously? Will this count as a closed incident? If so perhaps this is how they hope to lower the crime figures? Should we have the right to bear arms as the US does? The second amendment was influenced by the English Bill of Rights 1689 and also dealt with personal defense of English subjects. My point being, if you cannot rely on the police to attend a “serious incident” then should we have the legal right to defend our family and home? I am not advocating the use of firearms, however non-lethal firearms like tasers and pepper spray could be a realistic possibility in the UK if you cannot rely on your local police force. With more cuts in the UK police force, the likelihood of other similar incidents happening is very high in my opinion. I would like to thank the gentleman on the red bike who stopped to try to stop the 1st assault on my son. I would thank the 2 different Ka drivers who stopped, but they only stopped to watch the assault not stop it. As a parent I can only hope your son or daughter doesn’t get assaulted and passers by stop to watch. Can Social Media Kill Your Business? Google Panda 4.0 what’s it all about? Grand Theft Auto V PC – Sign the Petition! Smart phone evolution or revolution? Is Virtual Reality the next BIG thing for PC Gaming?